National treasure Vin Scully has said this year would be his last in the broadcasting booth. 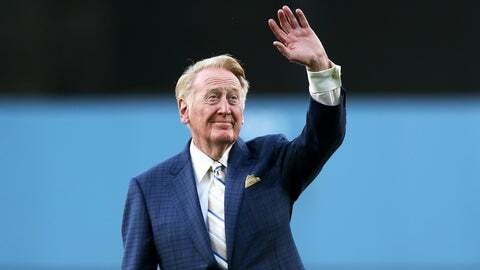 In January, Los Angeles City Council voted unanimously to change Elysian Park Avenue — the road leading up to Dodger Stadium — to Vin Scully Avenue in honor of the legendary Hall of Fame broadcaster. On Wednesday a Twitter user by the name of Tom Denne caught the unveiling of the new Dodger Stadium sign — complete with the address honoring the national treasure. It just looks right, doesn’t it? The august 88-year-old Scully has said that 2016 will be his 67th and last season in the broadcasting booth. And while the thought of his absence is beyond sad for even the most cursory baseball fans, there is some comfort knowing Vin Scully will continue to pave the way for the Dodgers for ages to come.